Sysgen RPO started as a provider of software development services in 1991. With the rising demand for IT Human Capital in the Philippines, the company decided to shift its focus to IT staff recruitment in 1996. It was not until 2013 when Sysgen RPO decided to focus on resource outsourcing and offshoring. Outsourcing has been constantly changing as exhibited in the variations the industry has been seeing: BPOs, KPOs, and RPOs. Offshore Recruitment Processing Outsourcing (RPO) is one field of the outsourcing industry that focuses on providing services to staffing companies in the US, Canada, Australia, and the UK..
Sysgen RPO operates in the Philippines and recruits possible candidates who are in the US to fill the demand for high volumes of employees by partner staffing companies in the US. Possible candidates undergo standard screening procedures to assure that the candidate fits the job description well. RPOs such as Sysgen live up to global standards of communication as it bridges resume sourcing and recruitment across markets while bringing more employment opportunities in the global chain of production. Investing in the outsourcing industry can be a bit tricky especially with the complex nature of the business. Jimmy Roa, CEO of Sysgen RPO and a veteran in the recruitment, outsourcing, and IT industry, shares his insights with Outsource Accelerate Podcast host Derek Gallimore on how the company survived 27 years in the industry. Whether you are interested in knowing how Sysgen RPO became the success it is now, or are interested in entering the recruitment and outsourcing industry, this is the podcast for you. The Economist defines outsourcing as “a term used to describe almost any corporate activity that is managed by an outside vendor, from the running of the company’s cafeteria to the provision of courier services”. The definition was published online in 2008 during the peak of the outsourcing industry. More than a decade later, outsourcing remains to be of the same nature but with certain differentiation, as seen in the rise of Business Process Outsourcing, Knowledge Process Outsourcing, and Recruitment Process Outsourcing, among others. Sysgen, the mother company of Sysgen RPO, was incorporated in 1991 as a software development company. It focused on IT staffing during the Y2K era. In 1996, coinciding with the rise of wealth in knowledge and information, there was a change in local demands. Roa recounts the rise of the “demand for IT teams and IT staff from the domestic market. [That’s when we] started servicing Accenture and other similar companies and shifted focus on IT recruitment”. Sysgen, under the leadership of Roa, entered the offshore RPO space in 2013 as an answer to the potential of the recruitment outsourcing market. “They think we send Filipinos to the US. That is definitely not the case. We send candidates who live in the US and who are looking for jobs in the US. So that’s a form of outsourcing, especially for recruitment,” said Roa in explaining the nature of offshoring Sysgen adapts at present. Other motivations for entering the offshore staffing industry include the enormous volume of hires and the cost efficiencies needed by staffing companies in the US. It is because of this that “Sysgen has expanded to recruitment to other roles – testers, developers, business analysts, all sorts of IT positions,” adds Roa. When asked about the rise of artificial intelligence, Roa is transparent that it helps in pre-qualifying candidates but highlights, “In general, a human recruiter is still required to vet candidates, especially in dealing with people involved in IT. The human factor is still a big part of the process”. At its simplest, Sysgen RPO interviews, prequalifies, and vets potential candidates until they are endorsed to the staffing company. “Recruitment is a very human function,” he adds. “[This is a] good example of how singular the marketplace is becoming when really, there is no delineation between recruiters sitting in the US and those sitting here in the Philippines,” says host Derek Gallimore. Even when Sysgen RPO operates in the Philippines, the RPO staff represents the staffing companies well, especially to their US clients. With technology developing at maximum speed, it is definitely easier to work with teams spread out across the globe. Sysgen’s outsourcing services do not only cater to staffing and recruitment in the US. The company also offers IT support services to different companies in Australia, in the US, or UK through their offshore staffing division. “There are clients who would need assistance in engineering, quantitative analysis, for example,” says Roa on how Sysgen accommodates the demand for IT assistance by having in-house services. “Our job would be to look at the must-haves of the job description [from the client] and call candidates who we think will be a good fit for the JD,” he adds. Bridging the gap and making employment and recruitment a global process, Sysgen RPO holds a very data-driven universal process which focuses on the metrics and peculiarities required in a job description. Without the outsourcing initiatives offered by companies like Sysgen RPO, the global chain of production would never be the same. “You are a one-stop recruitment in a box,” pronounces Gallimore. To make Sysgen RPO your partner in resume sourcing and recruiting, you may check their website or call them at +2138143126. Roa, J. (2018). 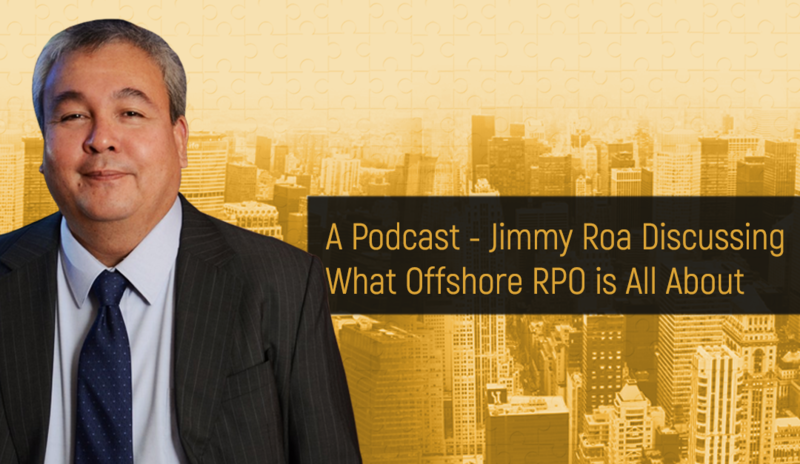 OA 193: Jimmy Roa – Recruitment Process Outsourcing. Interview by D. Gallimore. [Podcast ]. Outsource Accelerator. Sysgen has grown big enough to compete with the foreign providers. Why don’t you try cater to Banking & other Financial solutions as this industry vertical subscribes to imported solutions and more often than not are half-baked because the makers are not familiar with the local requirements of our governing bodies. Bottom line is, Banks pay huge amounts to customize to meet the specific business requirement.